Generally, fast-fill stations are best suited for retail situations where light-duty vehicles, such as vans, pickups, and sedans, arrive randomly and need to fill up quickly. The space needed to store the equipment measures about the size of a parking space. 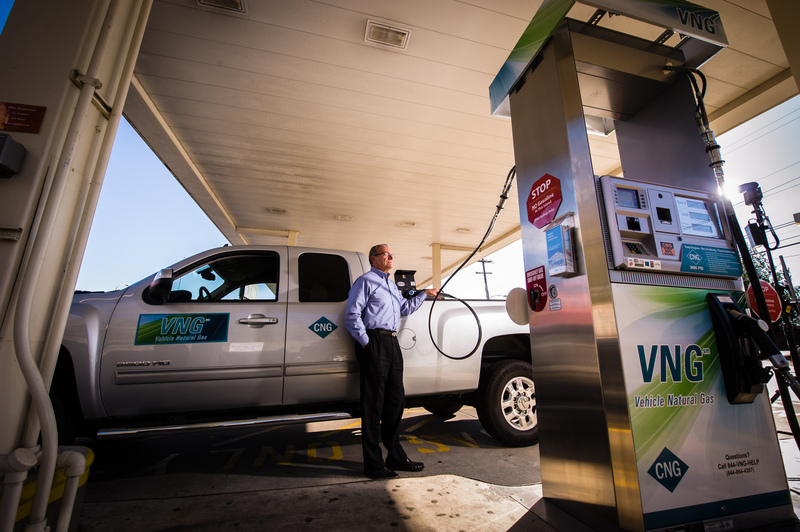 CNG can also be delivered via dispensers alongside gasoline or other alternative fuels dispensers. Fast-fill stations receive fuel from a local utility line at a low pressure and then use a compressor on site to compress the gas to a high pressure. Once compressed, the CNG moves to a series of storage vessels so the fuel is available for a quick fill-up. Drivers filling up at a fast-fill station experience similar fill times to a conventional gasoline fueling station—less than 5 minutes for a 20 gallon equivalent tank. CNG at fast-fill stations is often stored in the vessels at a high service pressure (4,300 psi), so it can deliver fuel to a vehicle faster than the fuel coming directly from the compressor, which delivers fuel at a lower volume. Drivers use a dispenser to transfer CNG into the tank. The dispenser uses sensors to calculate pressure and measure the number of GGEs delivered to the tank, taking temperature into account.